Those fateful words rung in my ears as I neared the town of Cameron, county seat of Milam County. Ben Milam, for whom the county was named, is one of Texas' legendary heroes, losing his life in San Antonio early in Texas' battle for independence. Statue of Ben Milam on the square. Originally, Milam County, established in 1836, covered a huge portion of Texas. Over the years, fifty counties have been carved out of it, from Hall County in the Panhandle Plains to Burleson County in the Prairies and Lakes Region. Like most Texas county seats, Cameron is just about in the middle of the county. It's named for Scotsman Ewen Cameron, who was shot by the Mexicans during the Mier Expedition in 1843. George Erath, whose name sure shows up a lot when you read about the beginnings of Texas, surveyed the area and laid out the town. The first courthouse, a crude wooden structure only 30' X 20', was also the first building in the city. That building was replaced by a second courthouse which met the fate of many early courthouses. It burned on April 9, 1874, but not until after the county clerk was shot. It was alleged that the clerk, a Mr. Williams, and his wife were attending a function upstairs at the courthouse. As they descended the stairs, he was pulled away and shot by Jim Boles. I reckon Boles had anger issues. Later, a counterfeiter, who had issues about getting caught, torched the courthouse to destroy the evidence. So the old Phillip's Hotel was used in the interim. The third courthouse, a brick structure with a cupola and weather vane, was constructed in 1875. Because of numerous maintenance headaches, including a gripy judge who complained that there was too much smoke in his office, it was decided in 1889 that a new structure needed to be built. 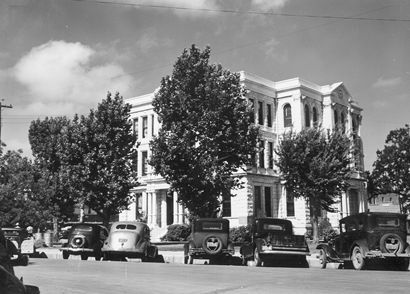 This fourth courthouse, the present structure, was designed by A. O. Watson of the Larmour & Watson firm. 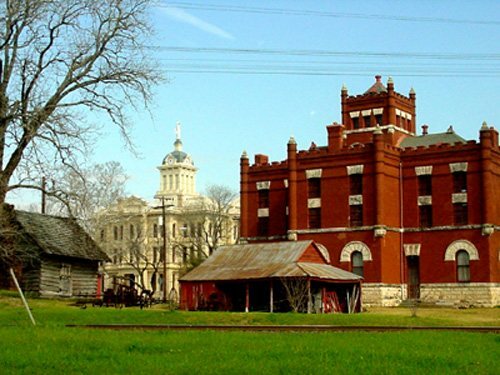 It was approved by the Commissioners Court on April 20, 1892. The old courthouse was torn down, and the new one was erected on its site. The design employed is Renaissance Revival with identical north and south facades. Made of cream-colored limestone, it is considered sixty percent fireproof. Square Corinthian columns rise from the heavily rusticated base, while the four entrances have non-functional balconies. 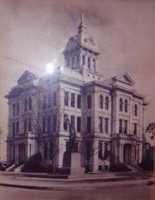 The fourth Milam County Courthouse, an 1892 Renaissance Revival structure designed by A. O. Watson. Notice the statue of Ben Milam in front. Photo courtesy of the Milam County Historical Museum. 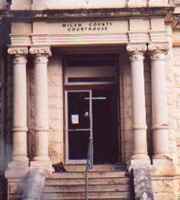 The entranceway to the courthouse. The Corinthian columns are a hallmark to the Renaissance Revival style. The original tower, clad with a decorative sheet metal skin rising above a Mansard roof; the clock; and the statue of the Goddess of Justice (which had been used for illegal target practice) were removed in 1938 during World War II. This was in response to the need for more metal for the War efforts. The metal skin and the clock itself were used for the war. The statue was put in a safe place, just in case it would later be put back on top. 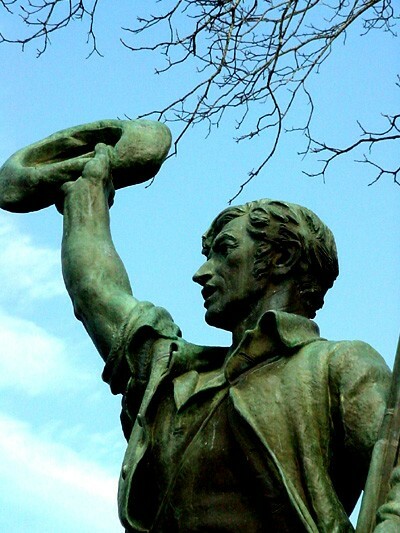 In fact, the place is so safe that after over fifty years, the statue still hasn't been found. A recipient of a grant from the Texas Historic Courthouse Preservation Program, the courthouse is being restored to its former grandeur. When we went by there in July 2001, the area was fenced off, many windows and doors were boarded up, and construction crews were hard at work. But right there on top of the new tower is the Goddess of Justice. She's not the original one, but she still reminds folks what the courthouse is there for. The Statue of Justice atop the new courthouse tower. The original statue is somewhere in a very safe place. 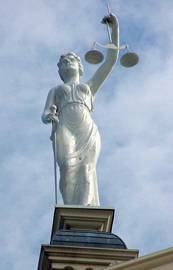 An interesting thing about courthouse statues in the South is that most, if not all of them, face towards the South. Those that had faced North prior to the Civil War were turned to face South. 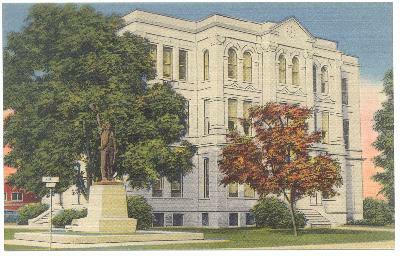 The original Milam County statue of justice faced South. I hope that when the reconstruction is finished, we'll be able to see the statue of Old Ben Milam again because as it is right now, he's practically hidden amongst the trees.